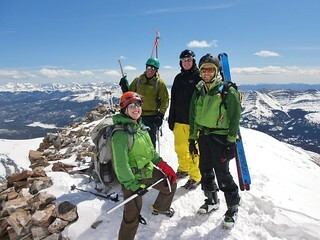 Group Shot on the Summit of Quandary Peak. 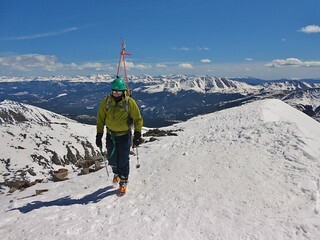 Fred approaching the summit of Quandary. Doug leading the way up Cristo Couloir. Here we are almost at the top. 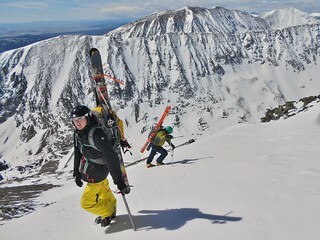 Bill and Fred topping out on the Cristo Couloir. North Star ridge is behind them. We ascended and descended via the Cristo Couloir. 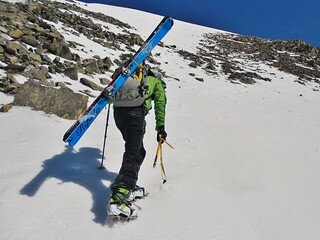 The guys skied down while I glissaded. What a great day! 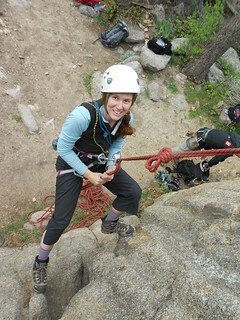 Jen practicing ascending a rope, using a prusik. Every year, I like to spend one day reviewing self rescue skills. It is important to practice, at least yearly, or else I forget how to do it. If ever there was a need for these skills, it really should be second nature. 5. 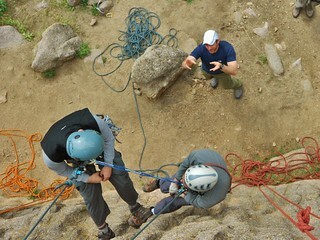 Rappelling to a Victim and “picking them off their line”. 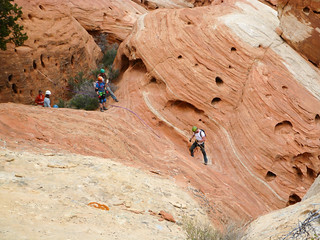 Then, rappelling with them down to the ground. 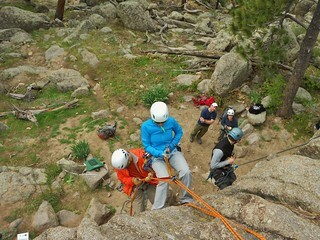 Much thanks to Darin, from Rocky Mountain Rescue, for coaching us through the motions! 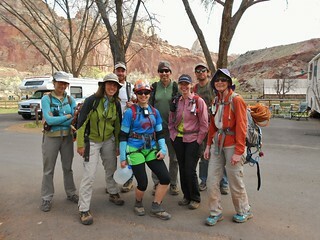 On Saturday, I led a Colorado Mountain Club canyoneering trip to explore The Wives of Capitol Reef National Park. There were three other CMC trip leaders in the mix, so we were bound to have a successful day. 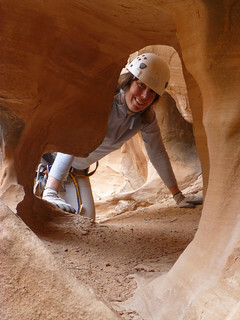 Thank you to Bluu Gnome for the beta and insightful comments regarding these canyons! The beta from bluu Gnome, waypoints, maps, etc, is spot on! After scouting out the area the day before, I determined we should start with Wife 3 and then do Wife 5. We weren’t able to locate the top of Wife 5, as the terrain was a bit confusing and the GPS point for the top was either entered wrong or I forgot to enter it! After hunting around a bit and having a lengthy discussion about the weather, we decided to go for Wife 4 instead. As four of our most proficient members descended into Wife 4, the rest of us scrambled down to meet them at the end. The weather at the top looked a bit sketchy, so this strategy made sure that they could travel down canyon faster and the rest of us could be outside the canyon in case something happened. Reunited at the bottom of the Wives, we headed back to the campgrounds. We got lucky with the weather in that it never rained, more than a few sprinkles, and the cloud cover moderated the temperatures. Later that night, we enjoyed a camp fire, with Michael strumming his guitar, and conversation flowing almost as freely as the brewskies. 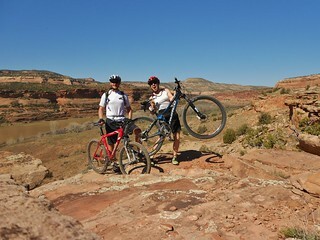 Dennis and I went mountain biking just outside of Fruita, CO. I rented a full suspension mountain bike with 29″ wheels, so I was excited to give it a try on single track! 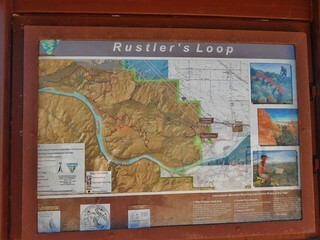 The nice guys at the rental company, Board and Buckle, guided us to the Rustler’s Loop trail. 1. It is close to Grand Junction, so returning the bike would be easy and we’d maximize the ride time. 2. The trailhead was easy to access with a non 4wd vehicle. 3. The loop has gorgeous views of the river, rewarding the rider along the way. 4. The loop was about 4 miles, just the perfect amount of commitment. We did it 2 times! 5. It is great for intermediate riders. 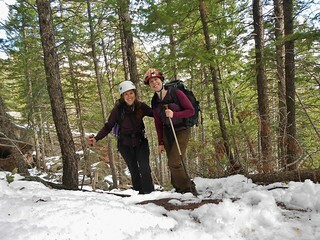 Jen and I are still hopeful to climb. This was when the sky was still clear! The base of Seal Rock was still covered in snow. 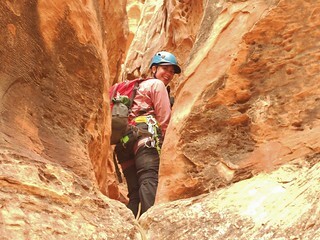 The route looked wet in spots, but still possible to climb had the weather remained clear. Unfortunately, upon our arrival to the base of Seal Rock, there were suddenly several little white puffy clouds. Hmmmm, what do we do now? When climbing on the eastern side of the flatirons, one can’t see the west side. Thus, since many storms come from the west, it can be dangerous to attempt a climb if there is ANY doubt of weather. The Accidents in North American Rock Climbing book is full of people who have been caught in a storm on a flatiron. 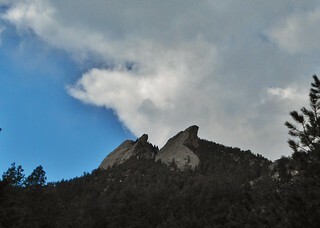 Wet flatirons are slick and prone to breakage. So, just say no! While we discussed the risks, we watched in dismay as the small clouds quadrupled in size and started banding together. We decided to forego the climb. We had a nice hike back to the car and we got graupeled on for the last 30 minutes. Whew, disaster avoided. 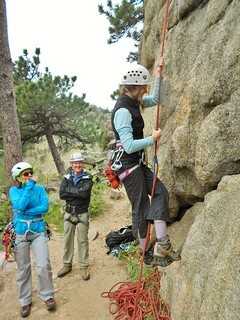 Justified by our smart decision; we climbed at the new climbing gym in Golden where we could be certain of our safety. You are currently browsing the climbergirl blog blog archives for April, 2014.